If you ever wanted a powerful and efficient registry cleaningtool then WinSysClean is the most effective registry cleaner. 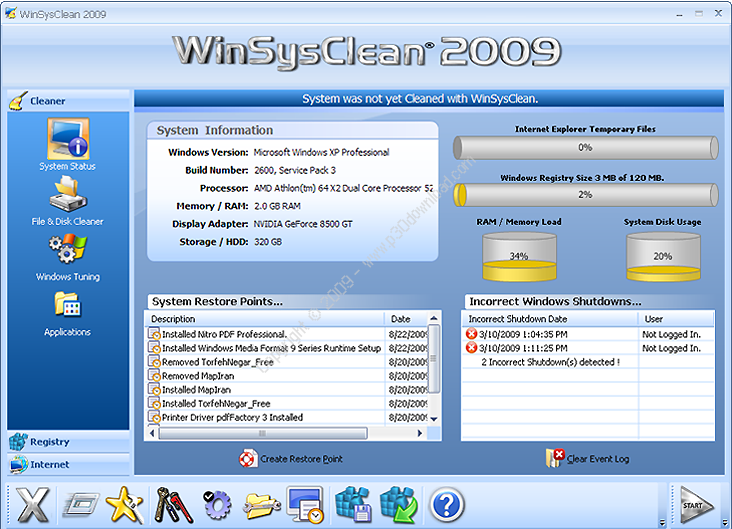 WinSysClean is a fully automated Windows SystemCleaner. All other windows cleaners puts all the responsibility onyou! Are you tired of complex questions asked by registry cleaners?, Well… try WinSysClean, it cleans/fixes/optimizes your computerwith just a single mouse click ! WinSysClean is safe, it uses complex analysis to skip importantdata from removal. Other tools are dumb, they ask you what todelete and what not, which takes you time and sometimes they makeyour demolish your Windows. WinSysClean is different from any other System Cleaning Tool, ituses advanced registry and file analysis in order to detect invalidentries, so you don’t need to make critical decisions to confirmwhich entries/files to be removed, because WinSysClean does thisfor you safely. You can also view a complete log of the operationsexecuted by WinSysClean, after a cleaning process.WinSysCleanautomatically optimizes your Windows System by optionally removingtemporary/unused space wasting files, unused and invalid registrylocations, invalid shortcut links, and many more. Uses the most complex registry analysis algorithm in order torepair the Windows Registry. This version includes over 34cleaning/repairing operations. By running WinSysClean, you will get more disk space and Windowswill run faster after a clean operation. The error files that WinSysClean searches for and deletes canproduce very hazardous results if not properly cleaned from yourdrive on a periodical basis. All this tasks are done by Professionals periodically by hand, nowyou can do it with just a single button click !, without beingaffair of damaging something ! – Loss of Hard Drive Space. – Lost network and Internet connections. – Inexplicable Application Lock ups. – Unexplicable General Protection Faults (GPF’s) or Fatal Errors inyour applications. – Out of Memory Errors. – Windows Applications are running slower than before. If the Windows System disk drive has very low space, it can causetotal malfunction of the Windows System. All these sympthoms can be reduced/avoided if you clean yoursystem/drive periodically ! These garbage files accumulate over time, occupying Megabytes ofspace on your Hard drive. WinSysClean will clean these files andrecover the lost space from your system. – Protect your privacy – Rremove all traces / history of yourInternet and computer activities. Remove traces from viewedpictures, viewed documents, visited websites, and more. – Clean your computer – Clean your system by removing unwantedInternet, E-Mail, temporary files or custom defined filesautomatically without being asked for critical decisions. – Maximize System Performance and Repair Windows errors – Removeunwanted/temporary information to recover disk space, remove/repairinvalid registry entries, all this will result in tunning your harddrive and memory access speed.